Continue reading The Sarcasm Game (idea). Tags: game design, if, sarcasm, voice. Continue reading What IF is harder and easier than. Tags: design, hadean lands, if, interactive fiction, zarf. I am pleased to announce the release of my new game, The Warbler’s Nest. It’s a very short work of interactive fiction, a mood piece more than a puzzle-filled adventure. An experienced IF player might take 15 minutes to traverse it once, and around half an hour to explore more thoroughly. Less experienced players may wish to budget a little more time, and keep a friendly quick-reference card handy. The game is sufficiently brief that I really can’t say anything else about it here, except to mention that you can play it in your browser, thanks to the happy modern-IF technologies I celebrated in my recent video. (And to remind you that works of pure text like this are about as safe-for-work as a videogame can possibly get, ahem.) Naturally, you can also download a copy to play on an interpreter, if that’s your thing, and a visit to the game’s homepage will satisfy any further curiosity you may have about the work. With that done, I’d like to share some thoughts about the Interactive Fiction Competition. A less polished version of Warbler eked out a tie for ninth place (of 26 entrants) in the 16th annual IFComp, which wrapped up last month. This was a very strong year, so I’m pleased that the game even made it that high; I played and quite enjoyed most of the other contestant works. First prize went to Aotearoa, Matt Wigdahl’s masterfully constructed take on the “modern kid visits an island full of totally awesome dinosaurs” style of young-adult adventure story. The annual community-wide metagame of creative and intelligent reviews of IFComp entrants seemed stronger than ever this year, as well. Among my favorite review collections of 2010 are those of Christopher Huang, Sarah Morayati, Brooks Reeves, and Emily Short. And yet: even though I look forward to writing and releasing my own next work of interactive fiction, I do not plan on doing so as part of the IFComp. 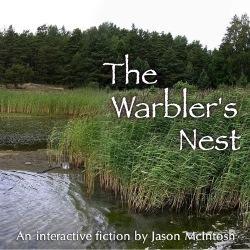 Continue reading The Warbler's Nest, and some IFComp thoughts. Tags: digital games, games, if, ifcomp, the warbler's nest. Continue reading Cut, wrap, take ten, take a trip to Cuba. Tags: hadean lands, if, kickstarter, zarf. Zarf’s Kickstarter, which ends today. A potential revamp of our website. Afterwards (likely around 8 or 8:30), some subset of us will head to the CBC as usual for food and/or drink. And as always, anyone is welcome, regardless of your experience level with IF. All right; I’ve let Andy drive the blog around long enough. While my last post about my rediscovered obsession with text games remains entirely true, what I did not mention — largely due to competition rules — was my own IFComp entry, and how much time and energy that little excursion took up. But I have finally published its post-competition release, and thus can take the Gameshelf wheel back for a while. In the near future I’ll post something more akin to a proper release announcement, followed by some number of post-mortem essays. (If there’s one thing that inspires lots of handwringey thoughts on IF game design and conventions, it’s writing one of the damned things. In 2010.) But before I get to those, I’d like to keep the spotlight on Zarf’s crazy project for just a little longer. As I write this, the Hadean Lands Kickstarter drive has less than a day left on its clock. If you’re reading this post on Monday, Dec. 6 (Eastern time), then you still have a chance to pledge your support, if you haven’t already. It’s true that Andy met his modest goal of $8,000 the very day the page went up, tripling that total well before today. But that doesn’t mean that this project couldn’t use every pledge-dollar offered to it! As described in the video on the project page, he isn’t just going to publish a single game, but also release for the world’s free use the various tools and frameworks he’ll need to create and improve along the way. In other words, your pledge doesn’t just help Zarf buy lunch; it’s an investment in the future of quality interactive fiction, by everyone who cares to write it — and, world willing, sell it. But just as important as the game and the technical work is the trail he’s blazing as an independent game creator in general. When sites like Rock Paper Shotgun picked up the story, I was happy not just because here was IF shouting another ping onto the larger game radar, but also because the unexpected success at this one crazy guy’s completely independent bid for support has definitely gotten many non-mainstream game creators’ gears turning. I myself have witnessed someone on an indie game-developer mailing list name-check Zarf while announcing his own launch of a game studio, even though it has little to do with IF per se. Tomorrow, Andy will start leading the IF community towards — we hope — a new flourishing of commercially viable interactive fiction. But besides and beyond that, we’re starting to see the effects of something wonderfully wider, and we have one more day to make it wider yet. Let’s make it happen, not just for text adventure games, but as a show of support for passion-fueled, creator-driven, future-changing videogames of all kinds. You know what to do.